This article is included for reference purposes only, not because fasting is recommended but because having an understanding of it can help in other areas. Should anyone decide to embark on a fast, the author emphasizes the importance of seeking a competent professional to supervise any fast beyond a few days. Fasting refers to a complete abstinence from everything of nutritive value (but not abstinence from water) for a period of time. A common mistake, even in medical books, is to confuse fasting with starvation. During fasting, the body draws on its reserves in a beneficial manner. Starvation begins when the reserves are exhausted, and if sufficiently prolonged, starvation ends in death. Because the subject of fasting is vast, anyone considering fasting is encouraged to read at least one of the classical books on the subject.1,2,3,4,5,6 Because some of these books are difficult to find, a search on the Internet for “therapeutic fasting” or “fasting can save your life” should provide information on fasting and on those who supervise fasts. See summary of 2016 Nobel-prize winner’s work substantiating benefits of fasting: http://www.pravoslavie.ru/english/print97617.htm. Most of us are exposed to pesticides; polluted air and water; pharmaceuticals; medical X-rays; nuclear background radiation; improper amounts of sunlight; devitalized foods that are missing essential nutrients and laced with pesticides, artificial colors and flavors; and food eaten in amounts and combinations impossible to properly digest, leading to bacterial decomposition and absorption of toxins and incompletely digested proteins. Over time, these factors plus dead tissue throughout our bodies cause inflammation, reduced or unnaturally stepped-up immune-system function, and even tumors. Fasting is a way of eliminating such factors or to restore health when one is ill. The beneficial effects of fasting have been known for thousands of years. Pythagoras (c582–c500 B.C.) is said to have required those who wanted to study with him to fast for forty days beforehand. The bible mentions fasting numerous times. Benjamin Franklin is reputed to have said, “The best of all medicines are rest and fasting.” Major zoos all over the world fast their animals one or two days a week to extend their life spans and improve their health. Unfortunately, modern medicine disregards fasting and rejects the possibility that it may have any value. One need only fast for a few days to become acquainted with its benefits, which include improved functioning of the brain and nervous system, rest for the entire digestive tract, and stepped-up elimination of toxins. As one who has fasted a number of times ranging from one to 28 days, I credit fasting with vastly improving my vision, digestion, clarity of thought, and general health. During a 26-day fast in 1971, among other benefits, a testicular cyst that I had had for decades completely disappeared and never came back. After a few difficult days of fasting, during which one may be ravenously hungry and weak, interest in food becomes essentially absent, and a marvelous feeling of energy appears. Of course, there may be periods of weakness, nausea, and other unpleasant symptoms caused by heavy toxins that are exiting the body. If the fast is continued, hunger eventually returns to signal a natural end to the fast. The underlying principle of fasting is that when the body is forced to utilize its own reserves, it uses the least essential nutritive material first. Therefore, fat, toxins and undigested nutrients residing in cells, dead cells, and even tumors are eliminated quickly and efficiently. To understand why the body works in this manner, consider that human life has been on this earth for about a million years, but the life forms from which we have evolved go back thousands of millions of years. Over this period, life forms have been periodically exposed to conditions under which there was no food for extended periods of time. Even one extra day of starvation can mean the difference between life and death. The evolutionary pressure on life forms to survive as long as possible without food thus gave rise to the ability to utilize every non-essential part in time of deprivation. Thus, humans have the capacity to utilize the least-needed reserves once deprivation of food extends for even a day. Expired cells, the proportion of which increases with biological age; partially digested proteins in the system; and even tumors all have some nutritive value. It makes sense that, for survival, the body will absorb this morbid material, excrete the toxins therein, and extract anything of nutritive value. The main action of the body is survival in the absence of food, but the secondary effects are a thorough cleansing of the system. During the initial stages of fasting, the body burns stored fat and glucose, which is liberated from stores of glycogen in the muscles and liver. Soon thereafter, the glycogen reserves are metered out more slowly, and protein is converted to glucose. The protein is absorbed from stores in the muscles but also from dead and diseased tissue. My conjecture in this regard is that the remnants of this absorbed tissue are recycled by sending them back to the digestive tract for digestion. That is, normally, digested nutrients in the digestive tract are absorbed into the blood stream; now, that process is reversed. This conjecture accounts for the fact that, during fasting, the tongue, which is the visible part of the digestive tract, becomes heavily coated, and the extent of this coating decreases as the fast progresses and usually disappears completely when the fast naturally ends and hunger returns. In some cases where reserves are insufficient to clear out all proteinaceous debris, hunger returns before the tongue clears. That is when fasting must be ended. Even though the muscle cells release protein, the number of muscle cells is not reduced, which means that after the fast ends and protein is introduced into the diet, the muscle tissue can return to normal. However, some of the fat lacing and surrounding the muscles may not return. Fasting is not without danger—those undertaking long fasts on their own are sometimes unable to distinguish fasting from starvation. Disastrous consequences—even death—may ensue. Because a fasting person’s sensitivity to physical and emotional stimuli increases dramatically, susceptibility to these factors must be kept in mind. Moreover, it is sometimes necessary to deal with “crises,” which can arise as deep-seated poisons leave the body during a long fast. Moreover, breaking the fast properly is of crucial importance. Therefore, it is imperative that anyone considering fasting for even one day become knowledgeable about the subject. It cannot be overemphasized that any fast longer than three days must be supervised by a competent professional. Because breaking a fast correctly is so important, it will be discussed later in this article. Some people feel that it is necessary to drink a gallon of water every day while fasting. How can an arbitrary amount of water suit a constantly changing body under constantly changing internal and external conditions? The needs of the body vary tremendously from hour to hour and day to day. On some days, little water is appropriate. On other days more water is required. But most experts agree that a gallon of water is far in excess of any needs. A one-size-fits-all mentality is antithetical to the sensitivity required to fine-tune the intake of water. On one hand, too much water dilutes toxins and, therefore, reduces the ability of the body to eliminate them. The body then must eliminate this excess water using energy that could otherwise be spent on removing toxins. On the other hand, too little water results in toxins becoming so concentrated that they are difficult to transport out of the body, and these toxins are damaging to the kidneys and other parts of the body. Too little water is much worse than too much, but both extremes are undesirable. Thus one must strive for the correct amount of water and know the signs of too little or too much. The criterion that some experts suggest is to drink water based on thirst. Unfortunately, many people have lost their ability to experience thirst reliably because of years of disregarding it and/or drinking all manner of “recreational” beverages other than water. Moreover, during fasting, the tongue is heavily coated and there is a very uncomfortable taste in the mouth. Therefore, an awareness of thirst can be masked by these factors. In my experience, it is of value to be aware of changes in bodily energy. When I feel slightly more tired than at other times, I try sipping water. Once the water is going down my throat, the needs of the body will more likely dictate my drinking the correct amount. Observing the color of urine can be misleading. The urine can be very pale yet heavily laden with toxins. However, if the color is darker than that of light beer, I take it as a sign that I am not consuming enough water. Another sign of insufficient water is a muddling of the unusually clear state of mind during fasting. Again, it is much better to drink too much water rather than too little, so if there is any doubt, err on the side of caution. Some people believe that drinking their own urine while fasting is advantageous. When water is unavailable and one might die from dehydration, such a measure might be appropriate. Also, there are some forms of therapy whose success stems from drinking one’s own non-fasting urine. However, during fasting, the urine consists of concentrated toxins that the body can only eliminate through that route. To return these poisons to the blood stream sabotages the efforts of the body to eliminate them. The idea that it is important to ingest essential nutrients that are in the urine is fallacious because the beneficial effects of fasting rely on depriving the body of nutrients. Moreover, there are no recorded cases of nutritional deficiencies arising from fasting. If anything, the nutrients liberated from absorbed diseased and healthy tissues are more than sufficient. A fast cannot mitigate years of wrong eating. Unless bad habits are well on their way to being reversed, they will likely be resumed as soon as the fast ends. Thus, it is important to regard fasting as a tool within a context of many other methods of self-improvement. Before considering fasting, an individual should first make every attempt to become educated about proper diet and apply that knowledge for a period of time. Then, after thus improving the body and preparing it by eating only fruit the day before, a one-day fast can be attempted. After successfully fasting for one day and eating judiciously for a week or so, it is permissible to try another one-day fast. After completing a number of one-day fasts, 36-hour or two-day fasts can be attempted. Eventually, a three-day fast can be tried. Again, any fast longer than three days must be supervised by an expert. During the first several days of a fast, hunger may be intense. After that, hunger usually subsides but returns when the body has cleaned itself out or depletes its reserves. Of course, many of us often erroneously think that we are experiencing hunger, which is a physiological need of the body for nutrients. Instead, what we may be experiencing is false hunger due to any number of the following: low blood sugar; an irritation of the lining of the stomach; food-addictions; the discomfort of the body in utilizing reserves; a desire for stimulation; a genuine need for essential nutrients, expressed by a craving for foods dilute in those nutrients; tiredness experienced as a need for food, thinking about, stimulation from seeing, or smelling food, habituation to regularity; or a desire for distraction from a distasteful task or chore. False hunger may appear during a fast for any of the above reasons and especially when one is exposed to the sight or odor of food, but after the first few days of fasting, true hunger is absent. Modern humans eat haphazard combinations of food in amounts impossible to properly digest. The partly digested proteins and putrefactive byproducts find their way into our bloodstream and cells and compromise our immune systems. We get improper amounts of sunlight, and our air and water is polluted with myriad poisons. Our foods are forced to grow on soil that is depleted of essential nutrients and laced with preservatives, artificial colors, and artificial flavors. Thus, over the years, every cell in our bodies has collected toxins from these factors. During fasting, when we start drawing on our reserves in the order of the least needed first, these toxins are released into the bloodstream at a high rate and must be metabolized by the liver and eliminated by the kidneys. The result of such a burden is nausea and the loss of any interest in food. The difference between humans of today and those of just 25-thousand years ago is that they were living in touch with nature. They were eating foods in their natural environment, getting optimal amounts of fresh air, sunlight, pure water, and physical activity. When our ancestors of that time were deprived of food for any length of time, their bodies started drawing on their reserves in the order of the least needed first. Because of a healthier lifestyle, their cells would have had substantially less toxins released into their bloodstream, and they would have been constantly hungry. It would seem that the lack of hunger during fasting results from toxicity, and once all the toxic debris is cleared out, the coating on the tongue leaves and hunger returns. Of course, for someone who is highly toxic, and whose vital reserves are depleted before all the toxic debris is cleared out, hunger, nevertheless returns as a life-saving expedient. That is why the return of hunger is considered as the definitive sign that a fast must be ended. At the beginning of a fast, several pounds of weight per day can be lost. This loss is mostly the contents of the gut and stores of water required to bind excess salt in the tissues. As the excess salt is excreted, weight-loss tapers off to about a pound or less per day. Fig. 1 is a graph of typical weight-loss during a “complete” fast (hunger returns and/or tongue clears). Fig. 1. 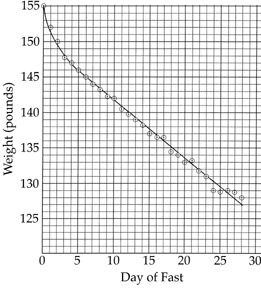 A graph of the weight loss during a recent 28-day fast done by the author. Please note that the vertical axis is broken and does not start at zero. The fast was begun in August, 2006. The graph plots morning weight versus the number of completed days of fasting. Note how the daily amount of weight lost decreases during the first week but then levels off to 3/4 pound per day as the fast progresses. A complete fast is one that is continued to the point of true hunger. The reason for fasting to completion is that, as starvation approaches and the body becomes more desperate for nutriment, it reaches deeper into tissues to retrieve abnormal and morbid tissue. Shelton reports that, in the case of serious disease, the last several days of a fast can mean the difference between success and failure. One difficulty experienced during a complete fast is that of well-meaning friends and loved ones who entreat you to break such a fast prematurely. This negative influence can be debilitating and even break a faster’s resolve. That is also why it is important to have such a fast supervised by an experienced practitioner, who can be relied upon to guide and reassure you. The first several days of fasting are the most difficult. A powerful appetite for food looms in the forefront. True hunger soon leaves, and unless one actively thinks about food, hunger is not an issue. Tiredness and headaches are common. Sugar-eaters are most prone to the tiredness and headaches resulting from low blood sugar, and coffee drinkers get headaches as they withdraw from their addiction. In fact, many headache remedies contain caffeine, which apparently is an antidote to caffeine withdrawal symptoms. Nausea and even vomiting can occur. The coating on one’s tongue is very uncomfortable, and the feeling in the mouth has been likened to “the inside of a motorman’s glove.” As the gaseous toxins released into the blood stream are expelled via the lungs, the breath becomes foul but very sweet as the fast nears completion. One experiences periods of elation, well-being, and surprising spurts of energy, and there are periods of weakness and giddiness. Highly spiritual experiences are not uncommon. Once the unneeded reserves are exhausted, fasting ends. Now starvation begins, in which essential tissues must be utilized for staying alive. Starvation ends in death. That is why it is of utmost importance for anyone on a long-term fast to distinguish the line between fasting and starvation. When fasting ends, one or both of two things occur. One is the clearing of coating on the tongue. The other is a return of true hunger, which is noticeably absent during the fast. The return of hunger is considered to be the definitive indication. The most important and perhaps the hardest part of a fast is breaking it properly. Here is where strong resolve is necessary not to succumb to the ravenous appetite that develops, which promotes resumtion of prior habits of wrong eating. Arnold De Vries8 and others tell of disastrous medical results of improperly breaking long fasts. For a healthy person, breaking a short fast is less critical. However, carefully breaking any fast extends and greatly augments its beneficial health and educational effects. There are many ways of breaking fasts that are used. Those who supervise fasts use freshly squeezed (not bottled!) juices (read about juicing), and others use fresh fruit eaten slowly. Bragg9 uses cooked tomatoes. The next meal consists of a raw salad of carrots and grated cabbage, with the juice of an orange squeezed over it. The Chinese use congee, which is rice that is boiled in a large amount of water for a long time until it breaks down into a soup-like porridge. Congee is said to be very soothing to the digestive tract and conducive to a natural return of peristalsis. However, adherence to time-tested rules is essential because, after an extended fast, the digestive organs are unable to fully function. Breaking the fast properly (absolute minimum of two days on a juice diet) will result in one’s digestive tract functioning optimally—an experience few ever have. I found that taking solid food during the first two days after breaking my most recent fast was not a serious mistake, but it was not the optimal way. On page 66, De Vries gives a schedule for breaking fasts of any length. He suggests that a 1–3-day fast should be followed by one full day during which a glass of freshly made juice is slowly sipped at 2-hour intervals. This procedure optimizes the digestion and assimilation of the juice. Afterward, foods should be selected, combined, and chewed with utmost care. Whereas fasts longer than three days should be supervised, for reference purposes, the relationship (suggested by De Vries) between the length of a fast and the number of days that should be subsequently spent on a juice diet for longer fasts is given in Table 1. By any standard, this regimen would be considered to be extremely conservative. All juices must be raw and freshly expressed from the highest quality fruits and vegetables. They must be sipped very slowly. The first day, the juice should be diluted in half with water. Carrot juice is considered the best one because of its balance of nutrients. Table 1. The relationship between the length of a fast and the suggested number of subsequent days to be spent on a juice diet. A more realistic, time-tested regimen for breaking a fast is given by Shelton10 for a fast longer than 20 days (Table 2). Shelton permits no between-meal or after-supper eating and emphasizes going slowly! Table 2. A regimen used by Shelton for breaking a fast longer than 20 days. Fasting is total abstinence from food for a relatively short period of time determined by natural conditions. The motivation for fasting is not weight-loss or body-image but improved physical and/or mental health. Fasting involves an application of millennia-old principles to attain better health or a heightened mental and spiritual state. During fasting, hunger is naturally absent and returns when the fast ends. The results of fasting are all positive: improved health and longevity and removal of toxic and morbid matter from the body. Energy and outlook are improved. Anorexia seems to stem not from the desire to be healthy but very thin, an erroneous idea promulgated by the movie and TV industry. In anorexia, an insufficient amount of food is eaten over an extended period, causing a lack of protein, vitamins, minerals, essential fatty acids, and other essential nutrients. There is a state of mind that hypnotically blots out hunger, which results in malnutrition (a state that has never been recorded to occur during fasting). Anorexia ends from outside pressure, forced feeding, or death from malnutrition. When I became interested in fasting in the late 1960s, I wanted to read every book on the subject. The books I was able to find were available only in health-food stores with large book sections. There was no Internet then so when I had exhausted these sources, it dawned on me to look in the medical library at New York University, at which I taught physics. There were only two books on fasting in the card catalog. One of these books was lost, and the other was written in the early 1900s. The available book was a study of only one individual. The authors did not seem to know much about any aspect of fasting, which they referred to as starvation. Their conclusions were that the subject of the study, a man in good health, lost a substantial amount of fat and muscle mass and was not as strong at the end as he was at the beginning. Other than that, the book did not seem to discuss much else or say anything negative or positive. I wondered how such an inexpensive, non-invasive, and effective healing tool, which has been known for so long and about which so many books have been written could be so completely disregarded by a profession dedicated to bringing sick people back to health. Even today, many “alternative” physicians seem not to consider that fasting could ever have any value. Over the years, I have formulated an explanation for what I consider to be the medical profession’s disregard of fasting and other time-honored areas of knowledge. The reader is encouraged to do likewise. The following is a link to a well-written and informative article although it gives no references: http://www.gaianstudies.org/articles4.htm. The article talks about many specific benefits of fasting and tells who should not fast, and who should fast only with professional supervision. 1Herbert M. Shelton, Fasting and Sunbathing, Dr. Shelton’s Health School, San Antonio, TX, 1963. 2Arnold De Vries, Therapeutic Fasting, Chandler Book Co., Los Angeles, CA, 1963. 3Hereward Carrington, Fasting for Health and Long Life, Health Research, Mokelumne Hill, CA, 1953. 4Herbert M. Shelton, Fasting Can Save Your Life, Natural Hygiene Press, Inc., Chicago, IL, 1964. 5Some of Shelton’s writings, possibly in edited form, are available from the American Natural Hygiene Society, P.O. Box 30630, Tampa Fl 33630, 813-855-6607. 6Paul C. Bragg, The Miracle of Fasting, Health Science, Box 15000, Santa Anna, CA 92705, 1975. Perhaps this book is not a classic; nevertheless, it provides much worthwhile information. 7See Robert Chuckrow, The Intelligent Dieter’s Guide, Ch. 6. 8Arnold De Vries, Therapeutic Fasting, pp. 63–64. 9Paul C. Bragg, The Miracle of Fasting, p. 75. 10Herbert M. Shelton, Fasting and Sunbathing, Dr. Shelton’s Health School, San Antonio, TX, 1963, pp. 393–394.